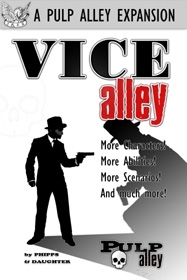 The PDF version of our Vice Alley book. VICE ALLEY introduces two new character types (Gangs and Associates), ten new perks, over two dozen new abilities, rules for Bystanders, and much more. Vice Alley also includes nine new scenarios and an open-ended campaign inspired by our favorite old pulp magazines and adventure serials.